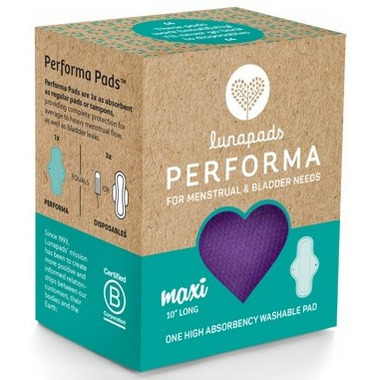 The Lunapads Performa Maxi is a high performance washable pad that feels just like your most comfortable pair of cotton underwear. Using 2 layers of super-absorbent microfiber, hidden between 2 layers of soft cotton jersey, Performa Lunapads were made to hold your heaviest menstrual flow and stop light bladder leaks in their tracks. The full coverage leakproof backing keeps everything off your clothes, while the wicking cotton top layer keeps you comfortable and dry. Performa Pads are so easy to use, just snap the wings around your underwear with the tag side facing down, and go about your day. Note: Inserts are not compatible with Performa Lunapads. For adjustable protection, consider the classic Lunapad & Insert Sets. The Lunapads Performa Maxi is 10” (25.5cm) long and approximately 3” (7.6cm) wide when fastened. Ces serviettes sanitaires sont tout simplement... parfaites! Douces, absorbantes, confortables, assez longues pour Ã©viter les fuites, je ne porte plus qu'elles la nuit lorsque j'ai mes rÃ¨gles! Ã€ choisir de prÃ©fÃ©rence en noir pour Ã©viter les traces aprÃ¨s lavages. Ou alors, ne pas oublier de les faire tremper dans du savon Ã lessive aprÃ¨s avoir prÃ©alablement enduit les tÃ¢ches de sel. I love this pad for heavy days. It doesn't leak, and it doesn't feel wet even after hours of wear. A great investment, since it will last a long time and save a lot of money that would have been spent on disposable pads. 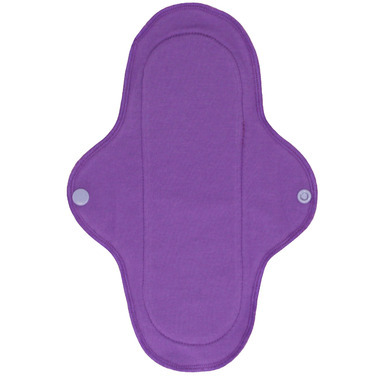 These a fantastic for period care and incontinence! Donâ€™t hesitate to try, they are worth it! Love this pad! As someone who has a spinal injury and suffers from urinary incontinence as well as being peri-menopausal-- lunapads are perfect! The cleanliness and comfort is unbeatable -- especially since they are worn every day. No more unbreathable disposables for me!